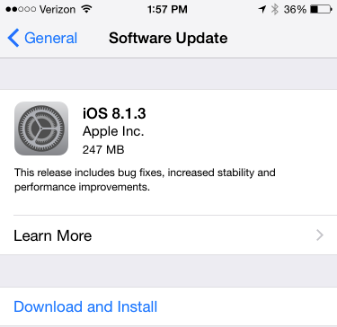 Yesterday afternoon, Apple released iOS 8.1.3 a minor maintenance release to iOS 8. Yes, this update is safe to install. Since this is a maintenance release, there are no major new features or interface changes. 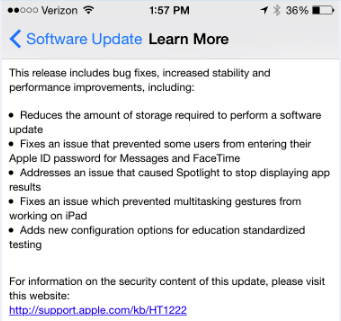 The areas that received updates include a new installer that requires less free space on the device to perform upgrades, an Apple ID login fix for Messages and FaceTime, a Spotlight app search fix, fixes for multitasking gestures on the iPad and a new configuration option for test taking in school applications. I'm glad to see Apple working to fix these nagging issues. I've seen a lot of iPhones and iPads belonging to family members and co-workers who don't have the latest version of iOS 8 installed because there is not enough free space to download, unpack, and install the update. I'm also gald to see the fix for the Spotlight search feature. I very often use that feature as an app launcher and it was super annoying to have to restart my iPhone 6 to restore app search. The next update for iOS is 8.2 which is currently in developer beta testings. iOS 8.2 is expected to bring new features, including support of the Apple Watch in the near future. While no release date has been set for iOS 8.2, it is currently up to beta release 4 and is expected to be completed right around the time Apple Watch launches in April 2015.
iOS 8.1.3 is available for all current model iPhones, iPads, and iPod touches.